Stoughton (Stoh-ton), Wisconsin is well known for its Norwegian Heritage. You will find hints of it scattered throughout downtown. Come May, Stoughton really comes alive to celebrate their Heritage with their Syttende Mai Festival (Set-ten-de-my). With the help of locals and visitors from all over, the weekend-long celebration is a much looked forward to and very busy event every year. Why is Syttende Mai Celebrated? Syttende Mai is Norwegian for ‘the 17th of May’. While it seems like a random date, the 17th of May actually celebrates the Norwegian Constitution Day. This is a National Day and observed as an official holiday in Norway. Syttende Mai is celebrated on the weekend closest to May 17th. Stoughton, Wisconsin has a celebration that happens either the weekend before, the weekend of, or, the weekend after the actual date. What Does the Syttende Mai Festival Entail? 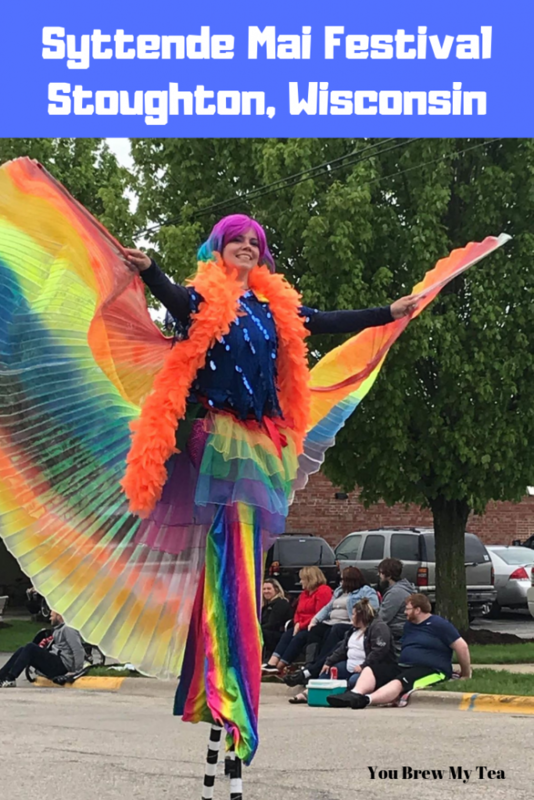 This three-day celebration kicks off on Friday afternoon and festivities continue all weekend until the end of the parade on Sunday. Food stands and trucks are scattered throughout downtown and activities are all over as well. It is a great weekend for socializing and enjoying great food. Friday begins the three-day event that is Syttende Mai. Many of the food trucks and tents open for lunch but, downtown is pretty quiet most the day. Come evening, it becomes more lively. The unofficial start is the canoe race. However, there is an opening ceremony that evening right before the canoe race. 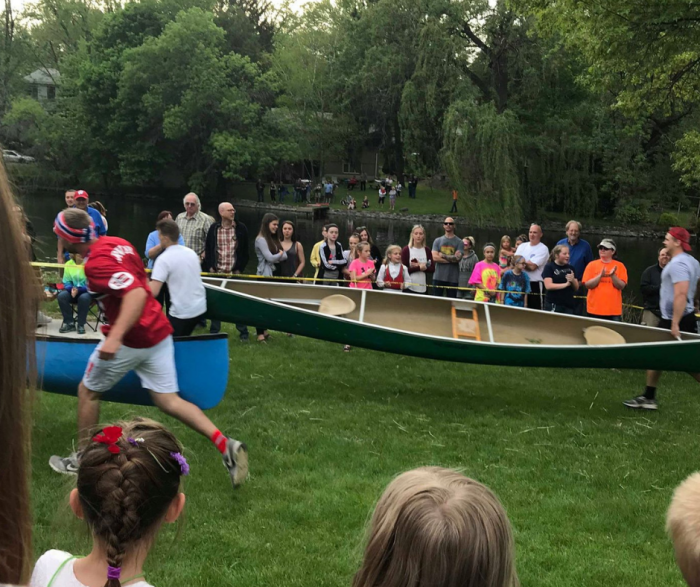 The biggest part of the canoe race is the portage. Many teams dress up in fun costumes to show off while they portage. You will also find a few other things happening in other parts of town. Stoughton Village Players put on a play several times during the weekend and Friday night is the first showing. You will also find a beer tent with live music (usually local bands) and a street dance geared towards the tweens. Saturday is the main day of the three-day event. There is so much going on that it is hard to do and see it all. Before the sunrises, the Run/Walk starts in Madison, Wisconsin. Runners start coming into town around 9 am. 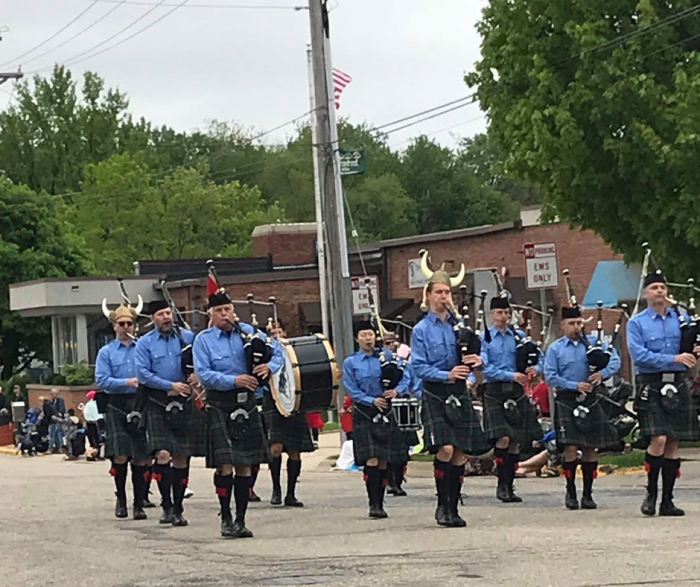 You will find another show at the Stoughton Village Theater, a craft fair at the Middle School, a Strongman/ Tough Woman competition, and several appearances by the Norwegian Dancers. Saturday afternoon, there is the ‘Kiddie Parade’. This is a short parade but, much looked forward to by the kids. It is always so much fun for them. You can also catch a show at the Opera House for most years. Sunday is a little bit more lowkey as far as activities go but, there is still quite a bit to do. The craft fair is still going and you can see one of the last showings of the weekend show at Stoughton Village Players Theater. The most looked forward to activity on Sunday is the ‘Big Parade’. Chairs and blankets are put out on Saturday night to save spots and vendors walk to road with cotton candy. The parade lasts about three hours and is a lot of fun. After the parade, everything starts closing and packing up for the year. Who Are the Norwegian Dancers? 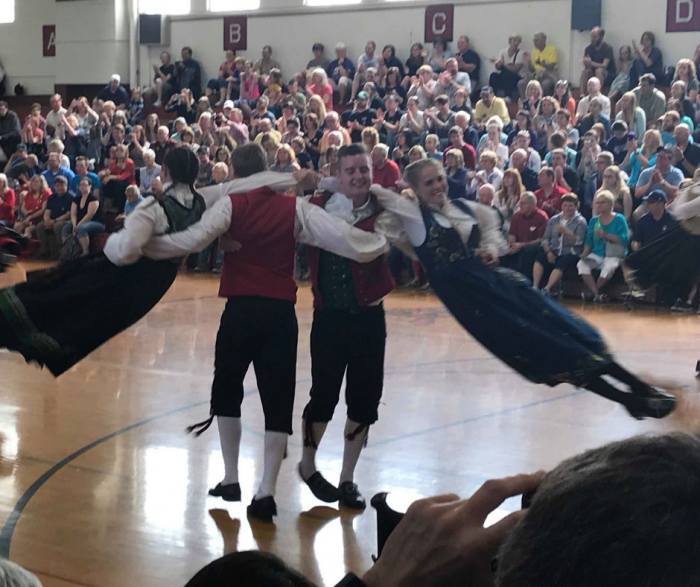 The Norwegian Dancers are a group of high school students that was started in 1953 to Honor the Norwegian Heritage of Stoughton. They share the traditional Folk Dancing commonly seen in several different areas of Norway. They can be seen locally and have traveled around the world as well. The group has grown from 12 dancers and accordion players to 20 dancers and three keyboardists. It is looked upon as a high honor to be apart of the Norwegian Dancers both by other students and those in the community. Syttende Mai means spring has sprung and summer is close. It is very looked forward to after a long winter. 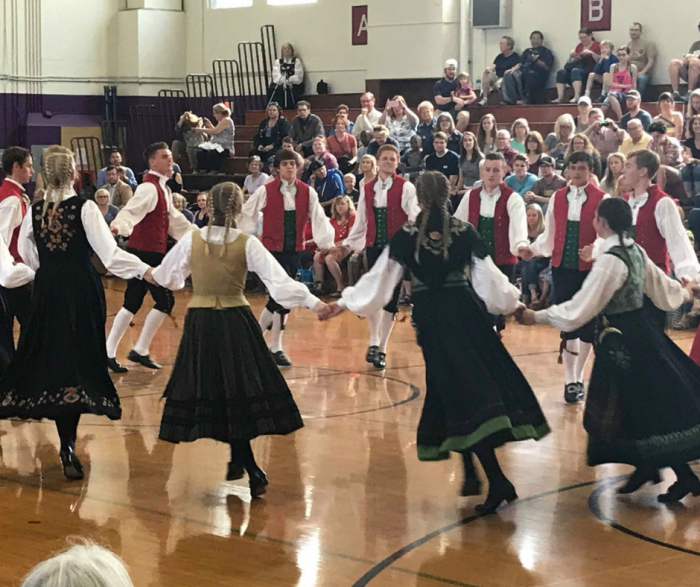 It is a time when the whole community gets together and visits outside enjoying the spring air (or rain) while celebrating the Norwegian Heritage that Stoughton, Wisconsin is known for. Potty training girls. That phrase alone makes me want to run the other way. You too, right? I honestly don’t think that it is anyone’s favorite part of parenting but, it is a necessary stage to conquer. I am here to try to at least help make it tolerable. As the mom of a girl, I have a lot of experience to share and make your journey easier. While this post is geared toward parents of girls, these tips can generally be used for boys also. Potty training girls is a bit different, but the concepts are often the same. No matter what, you can and will get through this phase of parenting. I know many preschools push for kids to be potty trained by 3 at the latest or they cannot attend. While I understand this as a former childcare teacher myself, it isn’t always possible. Trying to potty train your daughter when she isn’t ready will most likely not go well. In my experience, it only ends in frustration for both of you. This really honestly varies by child. There are a few common signs to watch for when your daughter might be close to ready to start potty training. Your daughter takes interested in your use of the bathroom. This doesn’t mean she just follows you in there because she can, this means she is paying attention to the steps you are taking. Typically, she will tell you what the next step in the process is. Excitedly wanting to flush the toilet for you. Waking up dry in the morning. 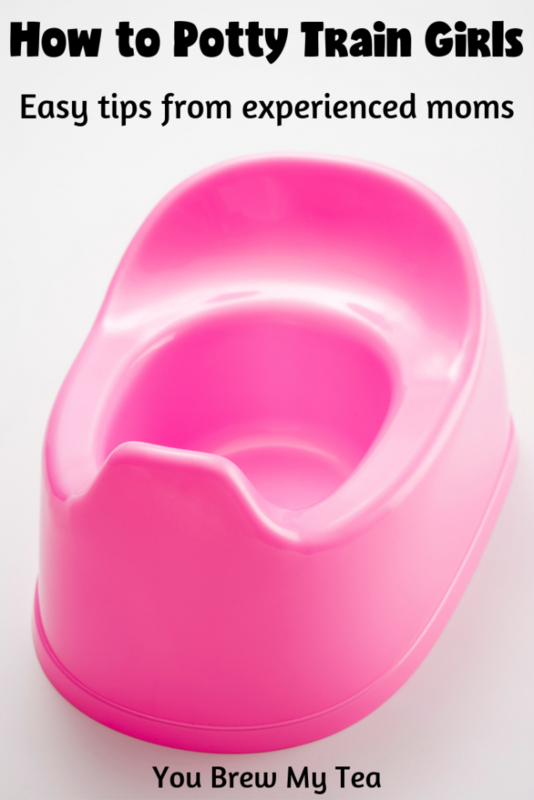 This is a huge sign that your child is ready to potty train as their bladder is now ready to hold urine longer. This needs to happen repeatedly for a week or two. If it only happens once, she may not have developed the control she needs yet. Telling you when her diaper is soiled. If your daughter typically tells you during the day when her diaper is soiled and needs to be changed, she is well on her way to being ready for potty training. She tells you before or right after she soils her diaper. If your daughter starts to tell you right before or just after that she has used her diaper she is just about ready to be potty trained. If and when these steps become part of your normal daily routine it is time to start working on potty training your daughter. Celebrate everything potty training related. Let her celebrate you when you use the bathroom and you celebrate her when she goes. Even if that means celebrating the fact that she sat on the potty. Celebrate every little step. Instead of making potty training seem more like boot camp make it feel more like a game. Kids love games and are more likely to go with it if they are having fun. We love the book P is for Potty as a fun one to read when kids start showing signs of readiness. Sticker Charts are a great way to help keep track of your daughter’s progress. Typically, I use these in steps. I start out by putting stickers up when she sits and tries then, I move up to giving stickers only when she uses the potty. Princess Stickers and Superhero Stickers are a great option for use on charts. Rewards help give your daughter a goal to look forward to. Many people use candy or presents but, that doesn’t have to be the case. It can even be as simple as staying up “late” for movie night after her chart is filled. Another option is an extra trip to the park or even something fun like a girls day where you give her a manicure or pedicure. Being consistent will be of the most help. If you aren’t consistent your daughter will get confused. This is the part that I find the hardest. I find that it is so easy to let the smaller parts of the potty training routine slip when I am tired but, it is important not to. Just remember to keep things fun as this is going to help your daughter stay interested longer. If she gets bored she may become uninterested. Be consistent and you will be on the right track to ditching diapers for good! These tips come from not just me as a mom of a girl, but other girl moms in my social groups. We’ve all found these tips to be the most used by all of us with success. No matter where you are in your parenting journey, you can and will succeed in potty training girls. It takes time, but the effort is worth the reward. It’s Springtime and that means Easter is just around the corner. 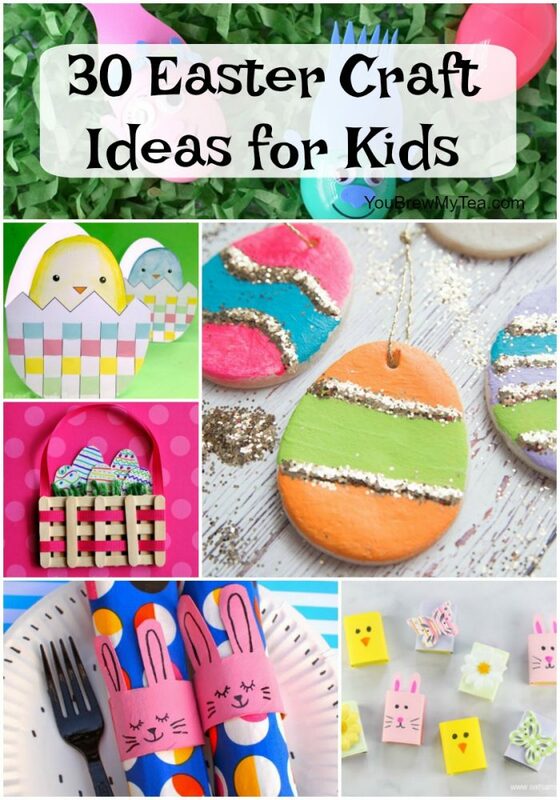 Below, you will see this list of 30 Fun Easter Craft Ideas for Kids! This list has so many amazing ideas to keep your kids busy and learning while they create and play. From classic paper plate crafts to homemade paints, there is no limit to what you can create using these tips and ideas. When Easter rolls around, I get giddy about all of the fun things I can do with kids. From dying and hiding the eggs, to the fun bright colors of the flowers that come along with the holiday, I am happy. Below are some ideal activities and crafts to keep your kids happy and having fun this Spring. Reading with your kids is another great way to help them learn and grow. I love grabbing books like these to read while the kids are doing some of the crafts above. Many of these are ideal for first readers or early learners. 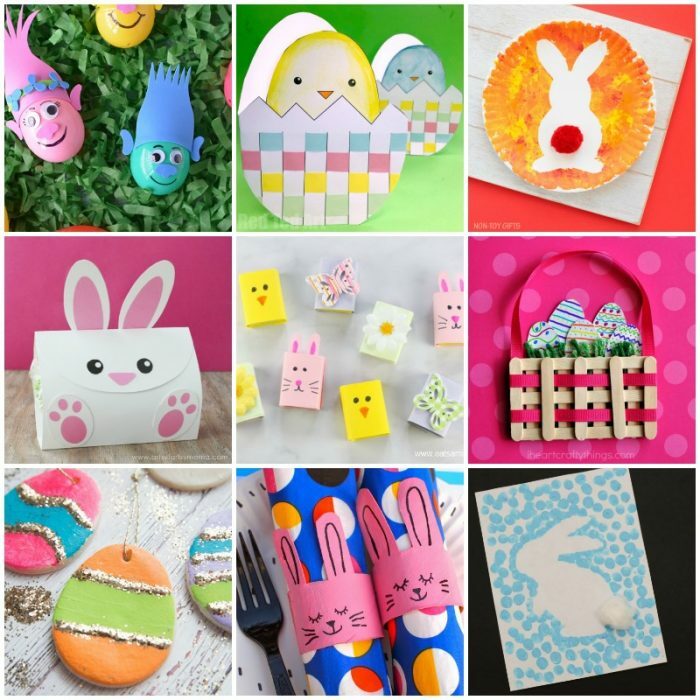 Along with making the fun Easter crafts above, you may want to check out some of our other favorite Easter and Springtime activities, recipes, and crafts linked below! While you may be on a diet, that doesn’t mean you don’t deserve a treat from time to time. 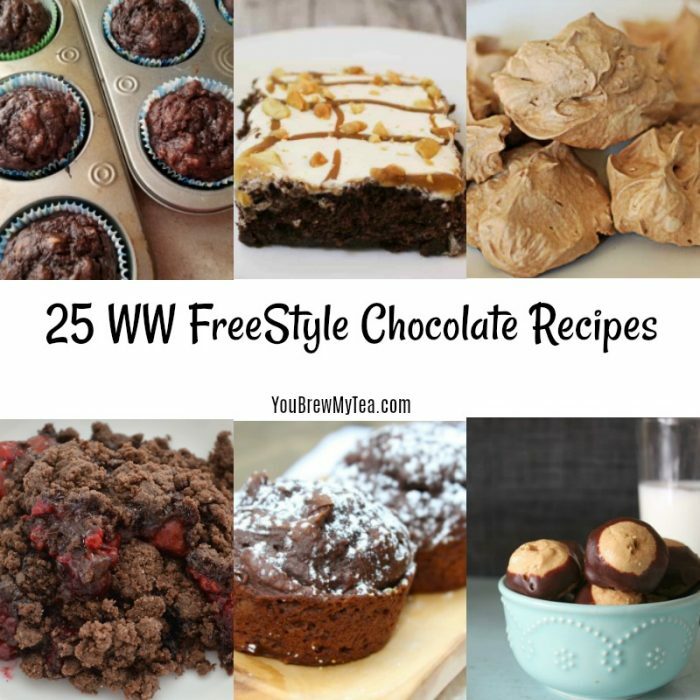 This list of 25 Weight Watchers Chocolate Recipes is going to be a go-to when you have a craving. 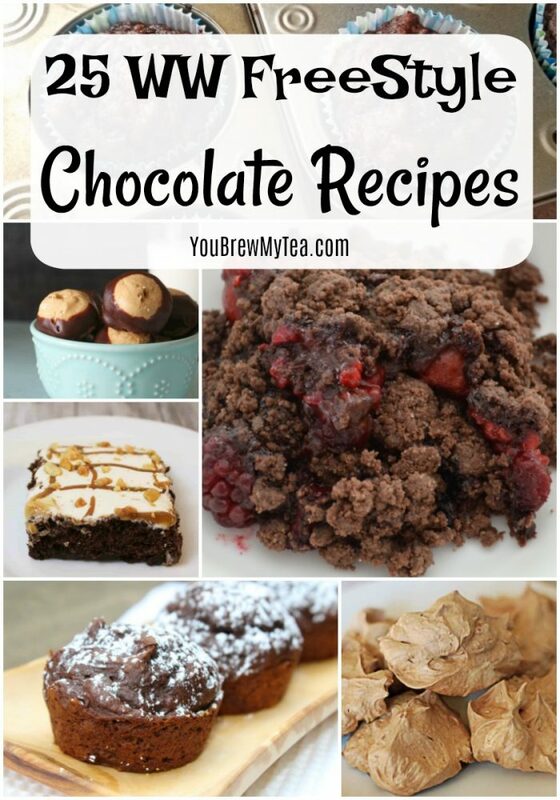 Below you’ll find some of our favorite delicious and flavorful chocolate recipes that easily fit into your diet restrictions. I am breaking down this list of Weight Watchers chocolate recipes by points to make it easier for you to navigate. There are tons of amazing recipes out there for making your own homemade desserts like shown below. If you are a bit lazy, like I am some days, then you may also want to have other portion-controlled options on hand. I love Chocolate Pizzelle cookies, SmartSweets gummy bears, and BuiltBar options for a low point but easy grab and go chocolate treat. Of course, man cannot live on chocolate alone. So, below you will find links to some of our other favorite recipes and recipe lists. As always, double check ingredients in your recipe builder to make sure you get the most accurate point value on any recipe as brands make points change sometimes. These days it seems like everything costs an arm and a leg. It is hard to get the family out to do anything because of that. Budget-friendly options are running low. This list of Things to do in Madison, Wisconsin with Kids proves this city still has a lot of budget-friendly options for families. It is still pretty easy to get out and about with the kids (even in the blustery winter months) when you check out this fun list! This post contains affiliate links. You may earn a small commission on purchases made via these links. Madison is one of the few places that still has a free Zoo. Over the last couple of years, they have expanded many of their exhibits. You really wouldn’t know that it was a free zoo just by looking at it. I can’t tell you about the Zoo and not mention the Carousel and Train Rides located inside of the Kiddie Zoo area. These do have a small fee (about $2 last time I checked) but, they are so much fun. Inside the kiddie area [and just outside of the carousel building] of the zoo, you will also find an awesome playground area. Henry Vilas Zoo allows you to bring your own picnic lunch in to eat if you prefer but, they also offer concession stands [during the summer]. They offer some great picnic areas near the concession stands for you to enjoy your food. Glacier Grille is another place to grab delicious food and is open all year long. From inside the Glacier Grille, you can see the polar bear exhibit. Olbrich Botanical Gardens is free and open all year long. My favorite time of year to visit is mid to late spring or during the summer. With a handful of themed gardens sprawled across 16 acres, it’s a great way to spend the day. You can also enjoy the indoor Bolz Conservatory for just $1 per person. Inside the conservatory, you will find lots of tropical flowers. Inside it will be quite humid as they are trying to recreate a tropical environment to help the flowers thrive. Housed within the University of Wisconsin Weeks Hall, the Geology museum is home to mineral and geode samples along with fossils from all over Wisconsin. Within the museum, you will find the vertebrate room. 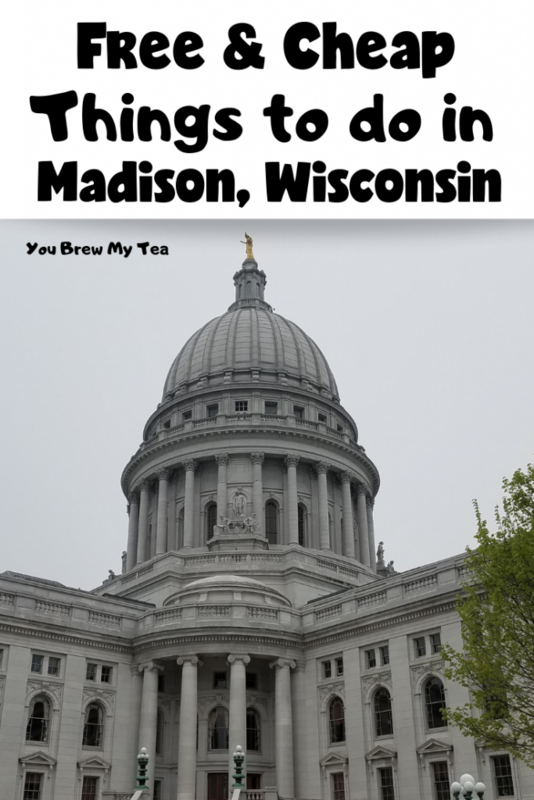 This is also one of my favorite things to do in Madison, Wisconsin for homeschool families. In the Vertebrate room, you will find models of dinosaur, mastodon and mammoth skeletons. While these skeletal recreations are pretty awesome to see, the best one (if you ask me) is by far the Boaz Mastodon. This mastodon skeleton (technically about ½ of it) was found in the backyard of a local Wisconsin family in 1897. Admission to the museum is free and you can download your own self-guided tour booklet. Tours are open to groups of 8 or more people but, there is a $2 fee per person. Check out the website to schedule a tour. There are several parking options in the area. To find your best option click here and scroll down to the bottom. Typically, the Children’s Museum does have an admission fee but, they offer Access for Everyone. This program makes it possible for everyone to enjoy the Children’s Museum. This gives discounted admission for those who qualify and some free days for the whole family. Free Family Night happens the first open Wednesday of the month. Everyone is able to get in for free from 5pm-8pm. Check their Calendar for upcoming Free Family Nights. If you are low in funds, planning for this can be a great way to get your kids out of the house and having fun one evening. With paid admissions, the museum offers free classes or programs available. Check out the schedule before you go. When visiting during the day, you are welcome to bring your own snacks or picnic lunch but, on-site you will find the Sparkler Cafe. The prices are much more affordable than I was expecting so this is a great option as well. There are a few different parking options close by. Open all year long, Aldo Leopold Nature Center is a fun way to learn about nature for kids and adults alike. Their outdoor trails and indoor play areas are free. Could it get any better? Yes! They are open 7 days a week. On the outdoor trails (open from dawn until dusk) you are welcome to take a self guided tour or, you can check out a Family Trailside Backpack. Each backpack contains an activity kit based on the current season. The backpacks can be picked up inside when the building is open. If you aren’t a member, the backpack does have a small fee of $5 per family. There are a limited number of backpacks so if you plan to grab one you can call ahead to reserve one. You can find the phone number here. Inside you will find the Nature Nooks. There are 4 different indoor nature nooks to enjoy. Each of them offer different environments to explore and learn. Self-guided tours are available daily for free. 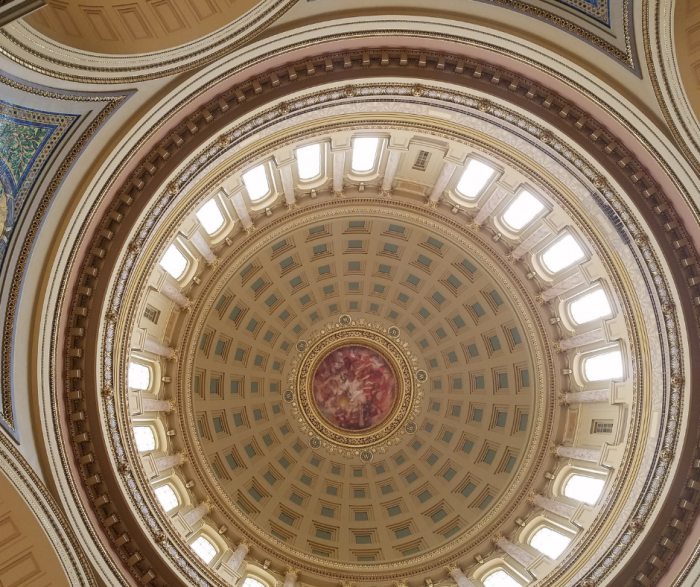 While you are inside the Capitol building be sure to lay down in the Rotunda and look up to the beautiful mural painted on the inner dome. There are a few places that aren’t available for the self guided tours but there are still a lot of things to see. Not to mention all the stairs for the kids to burn off some energy. If you can line your Capitol visit up with the Saturday Farmers Market during the spring, fall and summer you can easily make a day of it. Kids in the Rotunda take place at the Overture Center and is completely free. It’s a great way to get out of the house in the colder months as this only takes place from September through April. The seating is semi-limited in the Rotunda but, you can go upstairs and still hear what is going on since there is a cut out in the floor/ceiling. The cut out allows you to see into the Rotunda and gives you ample sound to enjoy the entertainment from upstairs. Each week the theme and entertainment provided is different. Entertainment can be anything from a choir, to a magician, to jugglers and so much more. The shows are typically at 9:30am and 1:00pm. There is ramp parking nearby with a small fee. The Memorial Union Terrace looks out onto Lake Mendota. Visiting the Terrace itself is free and you can enjoy live music during the summer months. Grab a bite to eat and relax. Don’t forget to grab ice cream while you are there! Nothing beats the ice cream found here! These are just a few of the free or cheap things to do in Madison, Wisconsin for families. Did we skip your favorite budget friendly place to visit in Madison? Share it below!